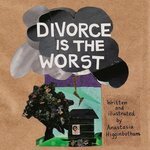 This book provides, thorough honest language and evocative imagery, a uniquely realistic view of how children experience divorce. While neither softening nor white-washing this difficult topic, Higginbotham offers an ultimately comforting message to parents and children experiencing separation and divorce. Higginbotham, Anastasia, "Divorce is the Worst" (2015). DIVerse Families. 851.